Republican Centre for Technology Transfer as a co-organizer invites R&D and industry experts, innovation SMEs to participate in the EEN Brokerage Event "Contact-Contract MSV 2018", which will be held in Brno, Czech Republic from 1 to 2 October 2018. "Contact-Contract MSV 2018" will be held within the framework of the fair "MSV 2018", which is the leading industrial trade fair in Central Europe with annual participation reaching more than 1500 exhibitors and 75000 visitors from 59 countries worldwide. That Brokerage event is a unique opportunity to increase your competitiveness and identify new markets and business partners. Six organizations of the National Academy of Sciences of Belarus will be present at 60th International Engineering Fair «MSV» (01 - 05 October 2018, Brno, Czechia). The International Engineering Fair is the most important industrial fair in Central Europe with an annual attendance of more than 1 600 exhibitors and 80 000 visitors. More than 50% of exhibitors and 10% of visitors arrive from abroad. Ninety-eight percent of exhibitors have established contacts with potential domestic or foreign customers. Belarus research institute of NAS of Belarus offers technology and equipment for production of soft magnetic materials based on iron powder. 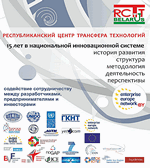 On the website of RCTT under "Manuals" is placed the e-book “Republican Centre for Technology Transfer:15 years in the National Innovation System (history, structure, methodology, activities, prospects)”. This book highlights the history, the structure, the methodology, the activities and the prospects of the Republican Centre for Technology Transfer (RCTT). The book is written by the RCTT’s staff and will be useful for specialists interested in the problems of technology transfer. The publication is available for view here (in Russian). The workshop " Technology Transfer as an Element of National Innovation Activity" took place in Minsk on 14 June 2018. The event was held at the Researchers Training Institute of the National Academy of Sciences of Belarus. The workshop participants - scientific researchers of organizations of the National Academy of Sciences of Belarus. The workshop was conducted by Dr. Alexander Uspenskiy, Director of the Republican Centre for Technology Transfer, Consortium coordinator of the COSME project “Enterprise Europe Network Belarus”. Republican Centre for Technology Transfer as a co-organizer invites R&D and industry experts, innovation SMEs to participate in the EEN Brokerage Event "Meet in Italy for Life Sciences 2018" (MIT4LS2018), which will be held in Bologna, Italy from 10 - 12 October 2018. The international event designed to boost business, partnering and networking opportunities in the life sciences sector: pharmaceutical/nutraceutical, medical devices, biology/biotechnology, IT applications for health, medicine, human health and well-being, related value chain activities. June 8, 2018 the delegation of the Korea Techno-Venture Foundation (KTVF) headed by Mr. Hee Ki Baek, CEO, visited the RCTT. The delegation consisted of representatives of 8 Korean firms. From the Belarusian side the meeting was attended by Dr. Alexander Uspenskiy, Director of the RCTT. There was a discussion of cooperation prospects in the field of technology transfer and technology commercialization. Belarus research institute of NAS of Belarus offers technology and equipment for high velocity sheet-metal forming. Main advantages are high efficiency, convenient and safe energy source and the ability to control the shock wave shape. The institute is looking for industrial partners for manufacturing agreement, commercial agreement with technical assistance, services agreement.